After visiting Italy for five and a half days, (It was hard to leave! ), it was time for Greece. I absolutely love everything about Greece, especially the geography and the history. Greece is basically Italy's neighbor. My first destination was Mykonos. You have to stop in Athens before flying to Greece's smaller islands. My flight from Rome to Athens was only an hour and a half, and the flight to Mykonos from Athens was a quick 25 minutes. 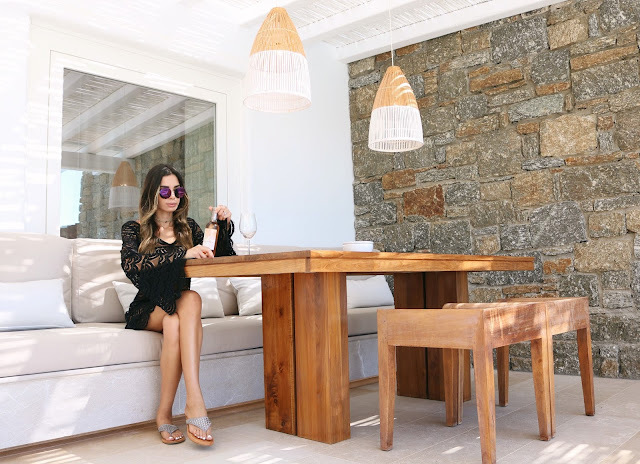 I had an unforgettable stay at one of the best resorts on the island of Mykonos, Bill & Coo Coast. Bill & Coo Coast is only a few months old, and is the sister hotel to Bill & Coo Suites and Lounge. Both five star hotels are apart of The Leading Hotels of the World. Located a few miles apart, both Bill & Coo Coast, and Bill & Coo Suites and Lounge exhibit and offer an ultra luxurious feel. Bill & Coo Coast is beach front with a private beach that feels like it's your very own. The view from my suite's balcony was unbelievable, with sunny blue skies and an even bluer Aegean Sea. 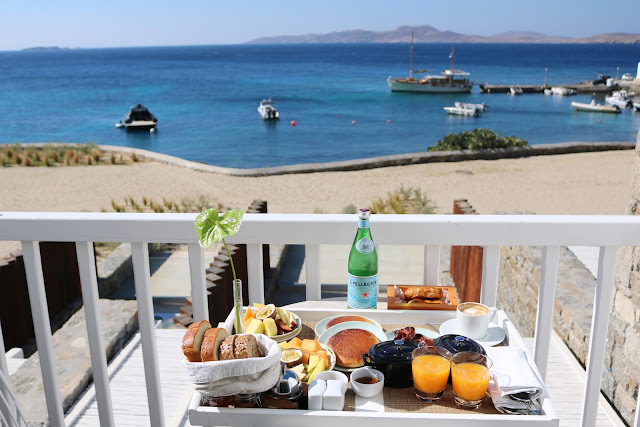 A delicious breakfast of Greek pancakes, bacon, pastries, fruit, and orange juice. Bill & Coo Coast is ultra modern, and secluded. You really do get full privacy at this resort. They offer a beautiful seaside, tranquil pool, Meditarranian-inspired cuisine, and it's breathtaking location has it's own beach, and is a quick ten minute drive away from Mykonos Town. Rosé X Chanel X The most beautiful view. Private pool views from the "Bill & Coo Coast" Suite. Opening my bottle of rosé. Cover up by Pily Q, Sandals by Sugar. One piece by Rachel Roy X Melissa Odabash. I spent most of my trip exploring Mykonos Town. Mykonos Town is one of the coolest towns I've ever seen. The buildings and cobblestone streets are all painted white. The town is right on the water, and the further you go into the town, it becomes almost like a maze. A fun maze with tons of shops and diverse restaurants. 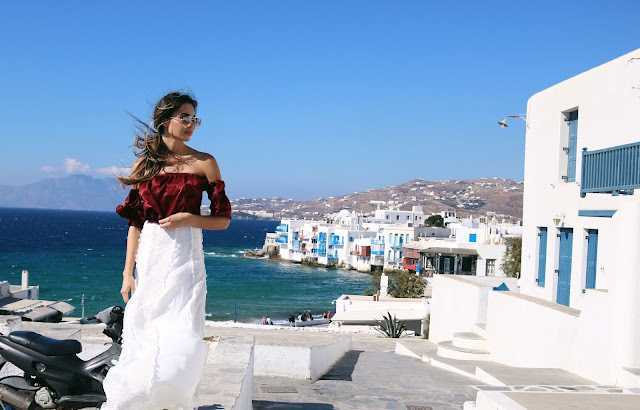 I absolutely loved Mykonos Town and it's a must see when visiting the island of Mykonos. Sitting at one of the many cute outdoor restaurants in Mykonos Town. All white in Mykonos Town. Sunglasses by Porsche Design, Dress by Lulu's. I visited Mykonos during is it's off-season, in the beginning of October. Mykonos is known as a party town with a vibrant nightlife scene during the Summertime (May - August). If you don't like big crowds, and lots of traffic like me, I recommend visiting in September through November, or March through April, when it is less crowded and there is less humidity. Another great thing about Mykonos is that it rarely rains. On my first night, I had dinner at Nobu Matsuhisa, which is the Nobu of Mykonos. Matsuhisa is located in the Belvedere Hotel. This restaurant is very cute, but small. I am sure it gets packed during their busy season. I am lucky to have experienced it when it wasn't too crowded. The food is amazing, just like every other Nobu location. Top by Fashion Nova, Skirt by Majorelle. Little Venice, Mykonos, is a small town on the water made of old historic houses. When sailors first inhabited the island from Athens, they started building houses on the water, in what is now called Little Venice. Today, the houses have been turned into chic bars and restaurants and have become a popular tourist attraction. Little Venice is very romantic, and definitely worth dining at. Soaking up the sun in Little Venice. Lunch and wine by the sea. The birds nearby were eyeing this plate of pasta while I was taking my picture. A very friendly local in Mykonos Town. I bought these bright lime green Converse sneakers in Mykonos Town. I love the pop of color against the white town. Picture perfect views in every corner of the island. On my last day, I spent the afternoon poolside at Bill & Coo Suites and Lounge. 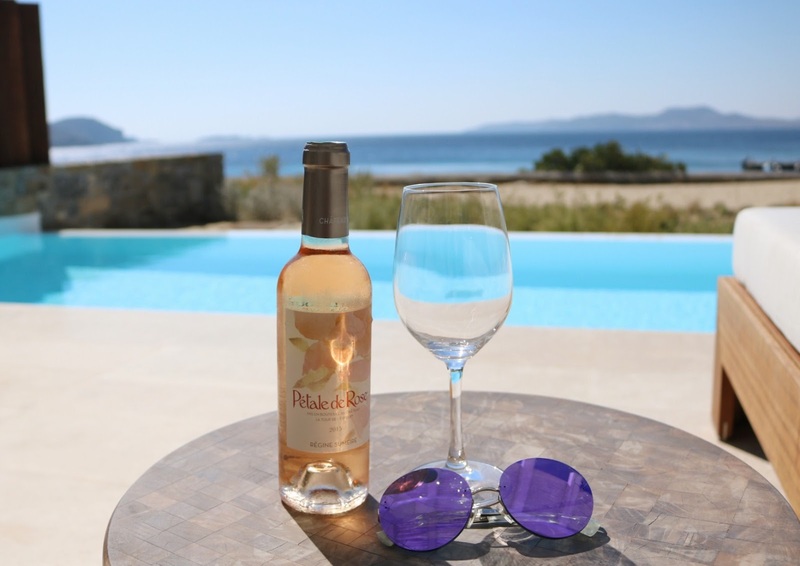 I enjoyed a delicious lunch, a glass of rosé, and the most beautiful sunset I have ever seen in my life. The sun is red like a ruby, and is breathtaking to watch as it slowly drops behind the hills. It's the type of sunset that is so stunning, everyone stops to watch it. The infinity pool at Bill & Coo Suites and Lounge is iconic. As gorgeous as it looks in photos, I know it's hard to believe, but it looks even better in person. You can sit poolside and enjoy a wonderful cuisine and drinks. Then, enjoy the best sunset you have ever seen. The stunning pool at Bill & Coo Suites at sea views for miles. I had such a wonderful time in Mykonos! Thank you again to Bill & Coo for having me. I cannot wait to come back again next year! Capturing the beautiful sunset. Dress by Planet Blue. My last sunset in Mykonos! So beautiful, will definitely make a trip there someday in the future.